Sierra Leone's capital Freetown has been closed down several times during the Ebola outbreak, emptying the city's streets. The West-African country of Sierra Leone has been severely affected by Ebola over the last six months, resulting in a high death toll, immense human suffering and a wide range of restrictive measures hampering economic and urban life. 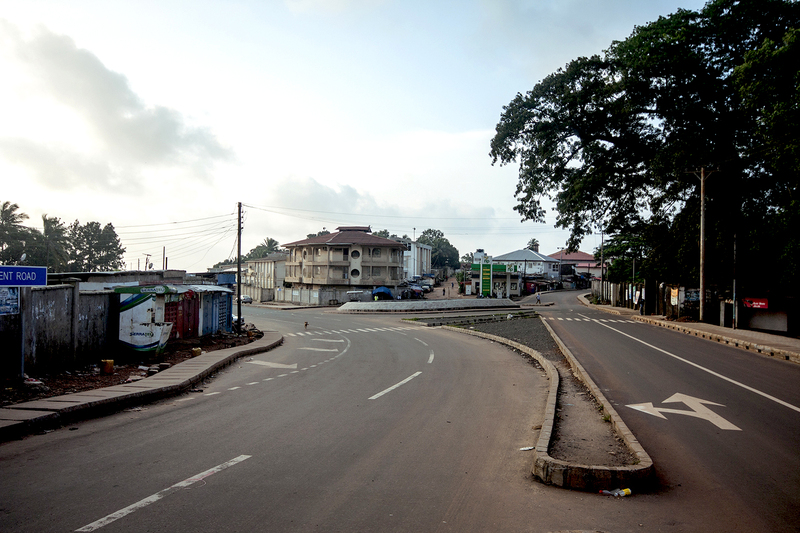 Multiple curfews in Sierra Leone’s capital Freetown forced the city’s inhabitants to stay at home, resulting in a seemingly deserted city. Killian Doherty, an Irish architect working at the collaborative practice Architectural Field Office (AFO) in Rwanda and Sierra Leone remained in Freetown during most of the epidemic and documented the situation in this photo essay. Failed Architecture’s René Boer talks to him about the impact on the city and its inhabitants and his role as a foreign architect. 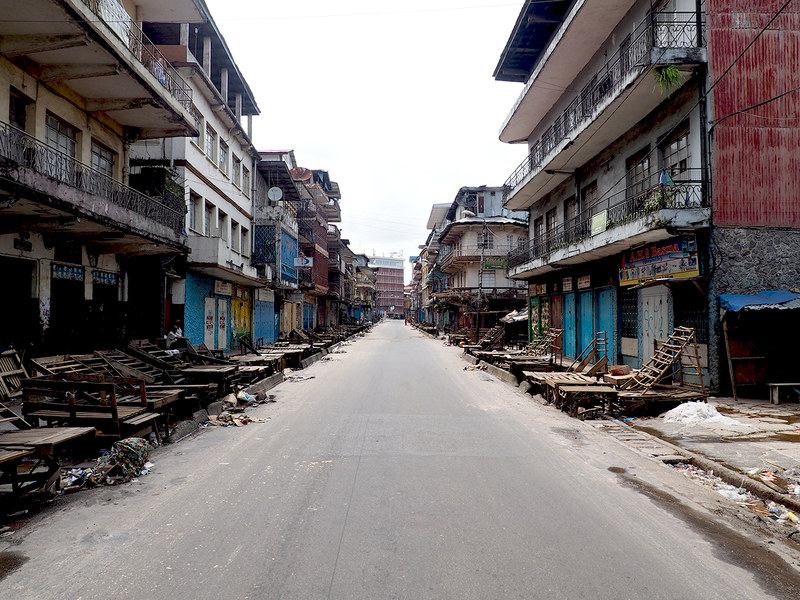 Impressive pictures – for how long have the streets of Freetown been like this? These pictures were taken during the second national lock-down or ‘stay at home day ‘, as it was/is referred to by the government, taking place from 19-21 September. The first one day lock-down occurred at the start of August as Ebola began to aggressively surface within Freetown. It had officially been acknowledged that Ebola was present in rural Sierra Leone since March yet little preventive measures took place in the three to four months in between. 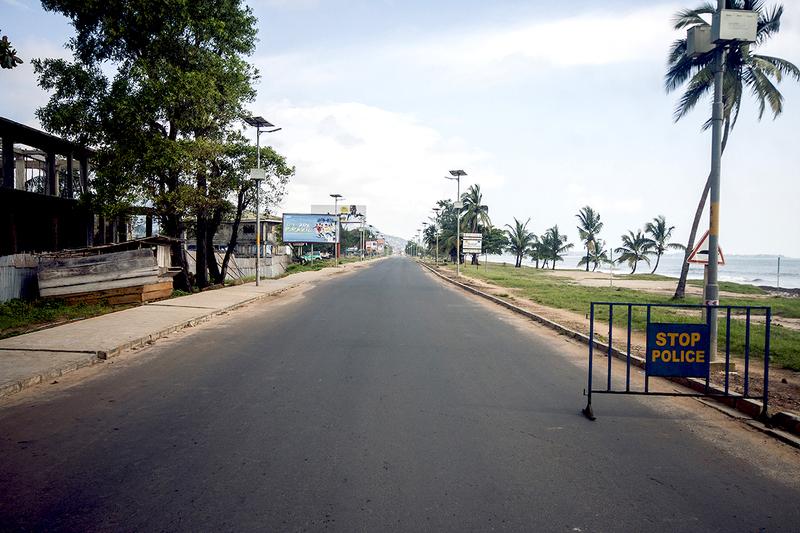 Once it began to emerge in Freetown the government introduced a country wide lock-down in an attempt to contain around the outbreak. These national lock-downs are the larger manifestation of a smaller set of sustained measures that have slowly and forcefully been implemented across Sierra Leone that prohibit particular activities across the country. Among those are social exchanges such as watching football, usually in informal ‘cinemas’, or nightclubbing. However, large religious gatherings that can last for hours with several hundred people are permitted. When major turbulence hits a city, I am always surprised to find out that few blocks down the road from where things happen normal life just seems to go on. Was the city closed down in its entirety? Yes, for the most part and from what I witnessed. It was heavily enforced by police and the military and passed for the most part peacefully. Some residents were on their stoops or porches and in the quieter streets people continued to cross between households, as an act of social solidarity. This must have been problematic for Freetown’s inhabitants. To what extent was urban life affected? The social impact of these lock-downs is variegated and widespread. This was a national lock-down; consequently, all of Sierra Leone and its inhabitants were affected. Imagine a city closed for three days. Whilst it sounds not entirely unappealing, in a country where 76% are living in poverty, in which mobility (with 87% of the people relying on public transport ) facilitates basic subsistence earnings, such a lock-down becomes hugely problematic. Food prices rocketed in the days preceding the lock-down, requiring the provision of rations for those at a loss. This rationing seemed to happen last minute in Freetown, evident by the long queues of people waiting in the streets. What also unexpectedly transpired during the three day lock-down was that many families with relatives who had died from Ebola (or Malaria or general illness) placed their anonymous bodies on the streets. They did so out of fear of being apprehended by the police as ‘suspected cases’. The lock-down in a way was a mechanism that drew the dead out of the city but it didn’t effectively respond to it as ‘contact tracing’ was almost impossible. I can imagine a curfew works out differently for different people – it has more of an impact for people dependent on street trade than for people driving to a luxury office outside town. Did you observe realities like this? Yes, very much so. Many who live hand to mouth from street trading were and are profoundly affected. Convivial activities that have also been prohibited are the movement of the ‘Okada’ motorbike taxis after 7pm. Okada drivers have long been marginalized within Sierra Leone (for many reasons, principally for their social status and ability to outrun the police) and have been accused of being complicit in transporting Ebola victims and increasing the rate of mobility of the virus. As street vending and market activities have also been curtailed, prices of food and clothing have gone up in Sierra Leone dramatically. A second hand T-shirt (usually imported from the west) sold on the street pre-ebola would go for about three dollars. In amidst the lock-down the price had doubled to six dollars. It seems like you have been easily exploring the city in these special circumstances. Wasn’t the curfew aggressively policed? 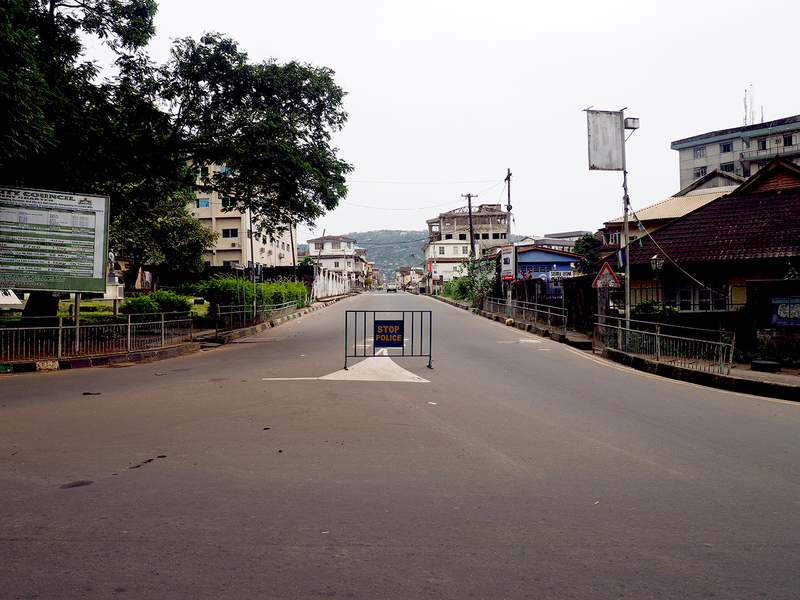 There were both military and police checkpoints on every major intersection or junction within Freetown. Only individuals and vehicles with a pass were permitted to move around the city. Such passes were given to those mobilizing around the Ebola response or to press officials. I masqueraded as a journalist’s aide. However, whilst the pictures do depict deserted streets, the vehicles permitted on the streets took advantage of the lack of traffic and would dramatically emerge from nowhere, flouting any concept of speed limits or road safety. Motorbikes and ambulances (the few that there were) would also break the silence carrying either Ebola samples or corpses to testing centres or onto burial sites. Did everybody observe the curfew, or was it ignored in some areas? Most people respected the lock down and it was (unsurprisingly) hailed as a success. However the public’s adherence to the lock-down has more to do with the manner in which it was enforced by the government than with an actual acknowledgement of Ebola itself. The lock-down was preceded by an address by President Ernest Bai Koroma, disseminated by radio and via whatsapp. Door to door visits were made by the government during the lock-down in an effort to sensitize the populace. However it was also a way to monitor and curtail mobility. The official figure is that 75% of people (4.5 million) were reached during the three day lock-down. This indicates the scale of this curfew and as an act of enforcement. Urban researchers in Cairo told me that when they observed their city’s empty streets during the curfews in the year of the revolution, they got new insights on the most basic, physical layer of the city, which they never had the opportunity to witness in that state before. 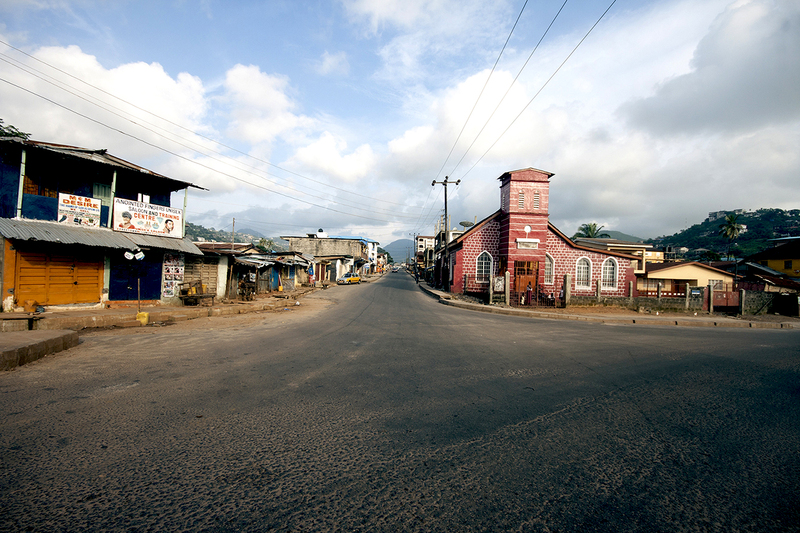 Did you develop new ideas about Freetown? 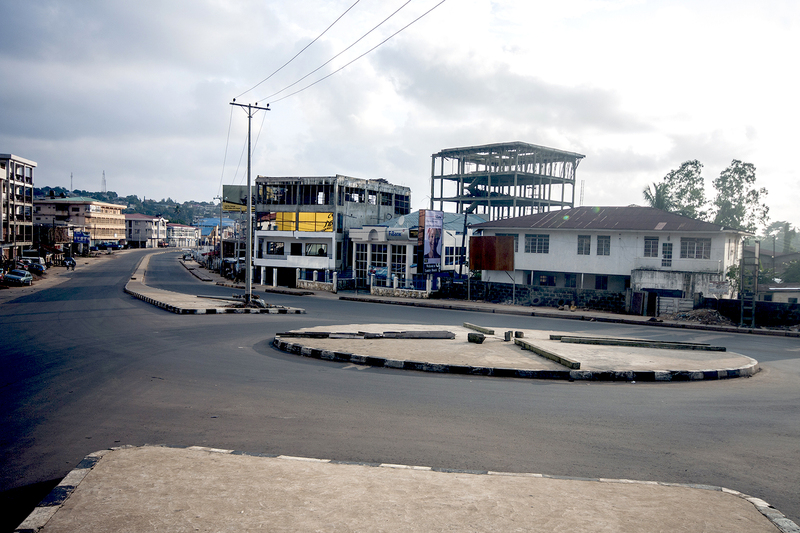 Freetown’s infrastructure (its roads, its water supply, etc.) is extremely dated. Most regard it fit for a city prior to the 1961 independence and for a population half of what it is now. There are/were simply not enough ambulances to deal with the rate of Ebola cases; Sierra Leone’s road network is extremely poor, lambasted by all who experience it; and a spasmodic national power supply renders most of Sierra Leone reliant on stand-alone diesel generators for electricity. 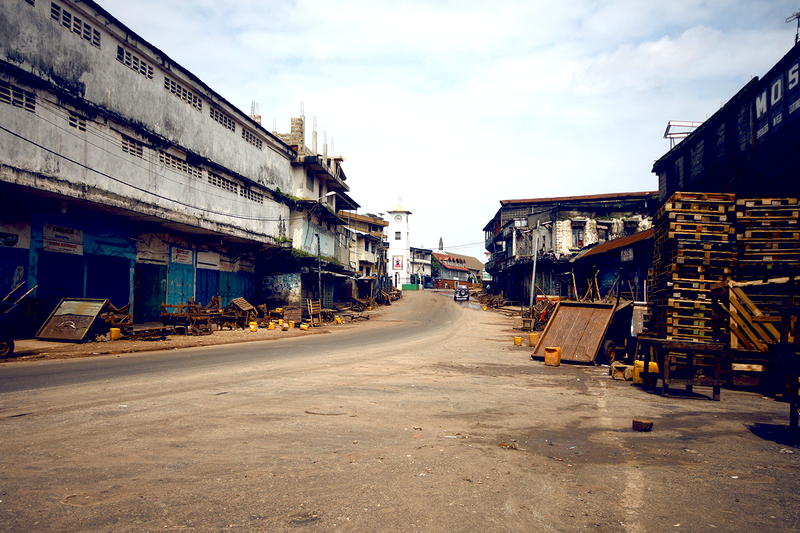 The Freetown lock-down underpins the inextricable relationship between infrastructure as a support system to the social and economic conditions of an urban centre. The urban geographer Stephen Graham wrote ‘infrastructures, the largest urban architecture of all, often becomes most visible when they lie dormant or inactive’. Finally, could you explain how life is like for a foreign architect/urbanist in an Ebola-affected city? It is extremely hard to position oneself as a professional or a researcher within such a diabolical event. On the one hand the event has brought about conditions that are rife for urban investigation and reflection. Yet on the other hand such a stance is from a very privileged vantage point of being the observer. This contradictory tension requires a constant readjusting of one’s position.